A political action committee largely funded by liberal billionaire George Soros is paying salaries to employees at a pro-illegal immigrant group. The Immigrant Voters Win PAC was launched in March with the goal of registering 400,000 new Hispanic voters before the November elections. The PAC is a joint effort between numerous left-wing immigration activist groups as part of the larger "Families Fight Back" campaign organized in opposition to Republican politicians. The group has raised $4 million since its inception, according to the PAC’s financial filings with the Federal Election Commission. Soros, who provided a $3 million check to the PAC on March 11, was the only donor to the PAC for nearly two months. The Civic Participation Action Fund, which carries the mission of "Advancing racial equity, economic opportunity and civic engagement," added a $1 million donation on May 31. The PAC disclosed $135,000 in federal operating expenditures, with much of the money going toward salaries to individuals at America’s Voice, an immigration organization that fights for "A direct, fair, and inclusive road to citizenship for immigrants in the United States without papers." The PAC also disclosed a six-figure reimbursement to the group. Matt Hildreth, the political director of America’s Voice, first received payments from the Immigrant Voters Win PAC on June 21. On that day, three transactions marked "salary" are shown to his name in the amounts of $8,541, $8,541, and $10,541. Lynn Tramonte, the third person from America’s Voice who received a salary from the PAC, is the group’s deputy director and also works as deputy director of America’s Voice Education Fund, which seeks to "educate the public about immigration policy, specifically to advance immigration reform that values citizenship and integration of immigrants mainstream into society." America’s Voice also received a $120,000 reimbursement from the Immigrant Voters Win PAC for communications consulting services on June 21. Soros said in early March that the "anti-immigrant" and "anti-Muslim" rhetoric from Donald Trump should come with consequences. Soros vowed to spend $15 million in an effort to court Hispanic voters. The "Families Fight Back" voter campaign was launched shortly afterward the Center for Community Change, the Latino Victory Project, and America’s Voice, all immigration activist groups. "With the rise of Trump and far too many in the GOP rushing to his side, this election could well turn out to be a referendum not only on immigration reform, but on our nation's core values themselves," Deepak Bhargava, the executive director of the Center for Community Change, told NBC News during a conference call announcing the campaign’s launch. Bhargava sits on the advisory board of Soros’s Open Society Foundation. 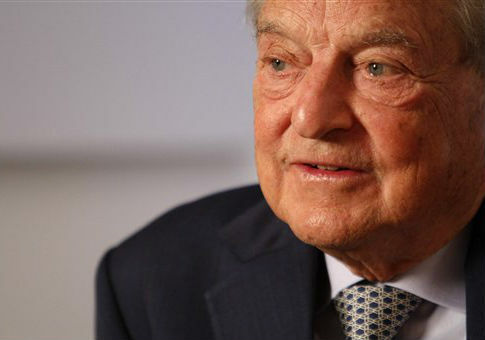 His group has received $2.9 million in funding since 2010 from the Advocacy Fund, a liberal lobbying shop associated with the Tides Foundation, a donor-advised fund that has collected millions from Soros. The Latino Victory Project, also involved with the "Families Fight Back" campaign, was co-founded by actress Eva Longoria and San Antonio-based businessman Henry R. Muñoz III, who has chaired the DNC’s finance committee since 2013. In 2015, Muñoz was scrutinized for helping raise money for Hillary Clinton’s presidential campaign despite rules saying that party officers must remain neutral during the Democratic primary. Longoria and Muñoz also ran the Futuro Fund, an arm of President Obama’s reelection campaign in 2012. The fund raised $32 million for President Obama’s reelection efforts. America’s Voice did not return a request for comment on the payments from the PAC to its employees. This entry was posted in Issues and tagged George Soros, Illegal Immigration. Bookmark the permalink.